West Central Minnesota's Early Childhood Initiative teams are a creative bunch. These networks of community partners care for families and children from birth to six years of age by providing education and experiences that support social and emotional development. 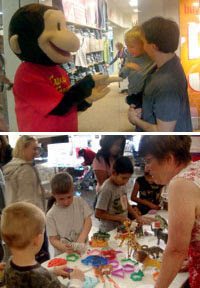 To celebrate Week of the Young Child, April 22-28, the Moorhead Early Childhood Alliance (MECA) invited kids and their families to meet Curious George at the local mall. More than 300 came for snacks, crafts, books, storytime ... and a photo op with George, of course! Parents could also pick up materials and information on the importance of the social and emotional development of young children.